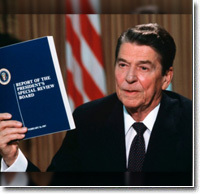 Washington, D.C., November 25, 2016 – Exactly thirty years ago, President Ronald Reagan announced to the nation – after weeks of denials – that members of his White House staff had engaged in a web of covert intrigue linking illicit U.S. support for a guerrilla war in Central America with a legally and politically explosive arms-for-hostages bargain with the Islamic Republic of Iran. The revelation quickly led to a new phrase – “Iran-Contra” – which became synonymous with political hubris, government incompetence, and dishonesty in the public sphere. Today, the National Security Archive posts a selection of materials that spotlight the last of the elements above – deceitfulness – whose relevance has sadly become more pronounced after a bruising political season marked by examples and allegations of widespread public contempt for facts, evidence and the truth. The historical record, including thousands of documents and hundreds of hours of testimony that are not possible to reproduce here, bears out the connection between the attitudes evident during the mid-1980s and what Americans have been witnessing in 2016.